Ending one year and beginning another is such an incredible opportunity. I can't imagine not seizing the vast open space in front of me – a whole year! As an artist – all I see is a blank canvas and a palette full of possibility!! One Word = A World of Possibility! I love the process of picking one word for my year. The process is really very simple. You pick a word. This word is one that is, in some way, just what you need at this time of your life. This word will guide you throughout your year. It is medicine for the soul. It oddly dips deep into your core. Choosing one word is getting at the source of transformation. It will alter you if you let it. Transformation is a process that happens at the level of soul and spirit. It occurs at the state of being. That is why saying “My resolution is to exercise more this year” rarely pans out. It at the level of doing. When you pick your word – you are picking a quality of life that you intentionally bring to every aspect of your life. You can not fathom how this quality will penetrate and open what is possible in who you are as a person. In 2011 I chose the word Grace. When I chose this word I had no idea what lie ahead of me. I had no idea that I would cling to this word and crack open what was possible inside the state of being called Grace. Who knew I would watch my daughter loose her ability to stand, sit, walk, or even pee on her own. Only by Grace, did I endure the days and months I sat next to her hospital bed with no diagnosis. Another year I chose the word Mastery. During that year I won over $12,000 in grants and was a Master Teacher for the state of Oklahoma. Interesting. . .
One simple word. One massive powerhouse. Here are two videos on the process. This first one is Christine Kane, who really created this process. Or at least for me she did! This second video is the gal from the Happiness Project and she gives a little different bent to this practice and it offers more inspiration. 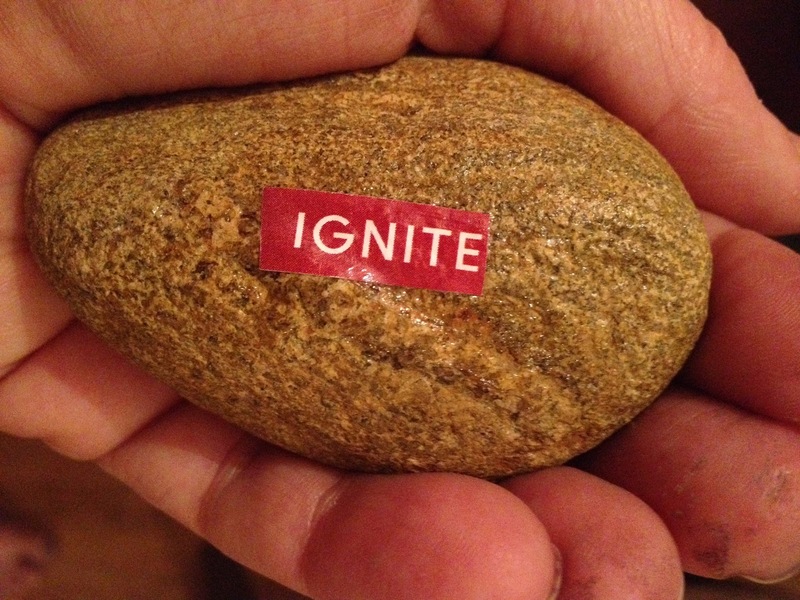 A fun practice: I take my word for the year and put it on a stone. I like to search through magazines and find the word. Then modge podge it on the stone. It is a beautiful reminder. Read through the list below. Check and see if any words pop out or immediately resonate. Some people will know instantly what their word is where others need time. What will your word be for 2013? I am choosing the word – ARTFULNESS. Bringing an artful life to 2013! My question to begin each day – What area of my life could use a dose of artfulness?! Last yeat I chose simple and loved the process of moving more slowly through my life. I found myself more thoughtful about choices and yes happier too! This year I have chosen joyful. I am purposefully looking for ways to be joyful, through a smile, literature, time with close friends and family and doing activities that fill my bucket; coaching, running, kayaking and music. Thanks for the inspiration.